My garden now . . . I am loved by creatures that eat my plants. And I was ready to be a gardener. ...and my garden then . . . But not as much as gardeners want. My two beds can’t feed just one. My seeds to buck up and grow! Is that what they’re called? The flowery outdoor work gloves. I even got the rubber mat for my knees. And paltry stash of veggies. I am a horrible gardener. And loved by real gardeners at the Farmer’s Market. I am the worst gardener. By those grocery stores that I keep in business. But I have my place. dilipchandra12--I'm glad you enjoyed the writing and the tomatoes! I didn't get many more tomatoes than that. I'm hoping to do better this year! Cute writing, the tomatoes at the end looks awesome. I must add, those tomatoes are the main attraction to the hub, enjoyed reading. Thank you. unknown spy--You're right; tomatoes are kind of exciting to watch. Perhaps next year I will focus on tomatoes only--all things tomato!--and see if I can do better! Cute poem. Gardening is one of my fave hobby too. And tomatoes are my fave plants. You watch them grow everyday, first you see green circles and then they turn red! Love the hub! Rochellee-yeah, I'm drawn in every year, even with being a horrible gardener with tiny tomatoes. LOL! So, Peggy, do you do any particular fertilizing? 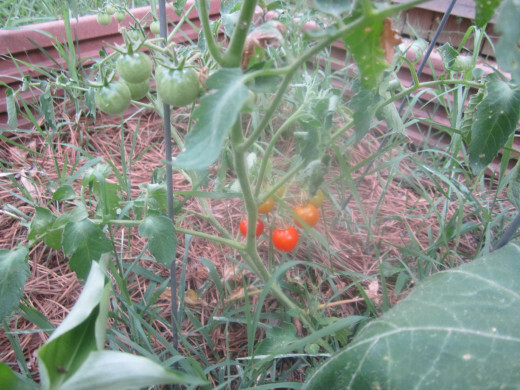 Only one year did my cherry tomatoes go bonkers and finally froze out in November as they were still producing. I didn't do anything special but stick some extra plants off on the side of the yard. Go figure. Then they won't grow well in the raised veggie beds. 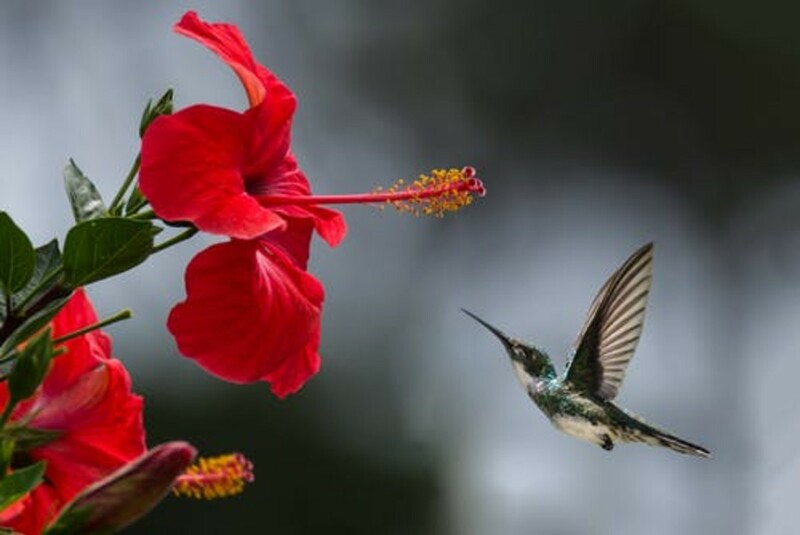 Write a hub if you have some gardening for dummies suggestions! LOL! We all have to start somewhere, and I'm pretty sure the tempting taste of tiny tomatoes will make you keep trying. I liked this, takes me back to my roots. Yummy, Jools. Yes, lots of heat here and little rain. Strawberries and cream sound wonderful! This was really funny! Still smiling. I particularly loved your ending about having your place. Haha! It is obvious that your tiny little cherry tomatoes are not on steroids. :)) This year my cherry tomatoes are going bonkers! 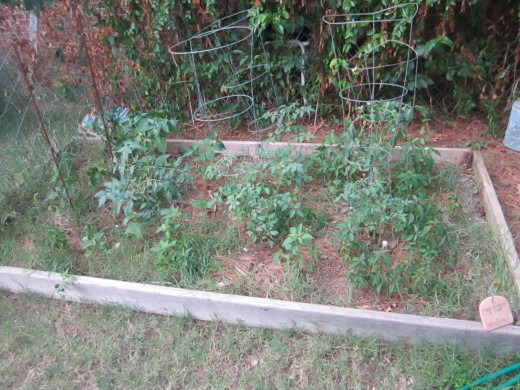 Another year I authored a hub about wondering why my gargantuan tomato plant was taking over the yard. Sounds good, right? Trouble was, it did not produce tomatoes! I guess some years are just better than others for those of us who deem ourselves gardeners. Voted funny and sharing this so that others can have a good laugh today. The rain has done for my gardening this year, we have had a months worth of rainfall in one day and everything is pretty waterlogged. Aw, thanks, Vellur. Those teeny tiny tomatoes were great. I'm getting two a day. LOL! Maybe one day I'll try a little harder! Enjoyed reading, the best thing is that you keep trying. Those tomatoes do look great. Keep trying that is the secret to success. Angelo, you're right. At least something good came out of my black thumb! This is so hilarious! The title caught my eye, and now that I read your poem I can see why. I can really relate to this for I am also a horrible gardener! Well, at least your bad gardening led you to a nice poem about it. Enjoyed the whole trip. haha, teaches! Great idea. Glad you enjoyed the hub and can relate to my gardening woes! Use those tomatoes as a garnish and you will have accomplished much! I have the same talent in growing veggies. And bugs are one thing I hate to have to deal with indoors and out. Enjoyed your hub. PhillyDreamer--You are brilliant! I would love astroturf! No mowing. And if I could afford a mansion, I think I would just hire a gardener!! I prefer synthetic gardens lol. I plan on buying a mansion tear up all the grass and replace it with astro turf. 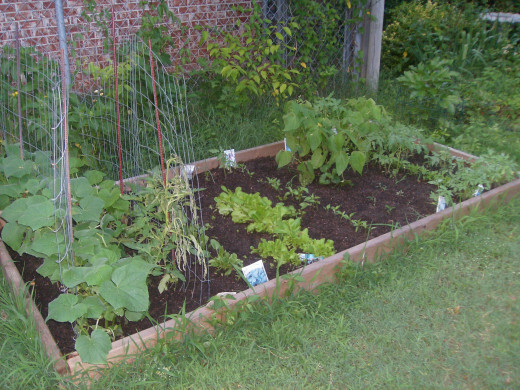 PhillyDreamer--I probably don't fertilize the soil right (or at all), and I let the weeds and grass grow back too much. That's all I can figure. I DO water the stuff! How are your gardening skills? rfmoran--I hate to dig, I hate to plan, I hate to weed--why do I even bother? Because I love fresh tomatoes, that's why! Maybe I'll get better! LOL. Did you ever find out what you were doing wrong? Joyce, I haven't tried potatoes. Maybe I should! Yeah, there's always next year. It is a bummer for me, because I love fresh veggies and I like to save money. Oh, well, I'm doing my part to boost the economy! Victoria, I feel your pain. 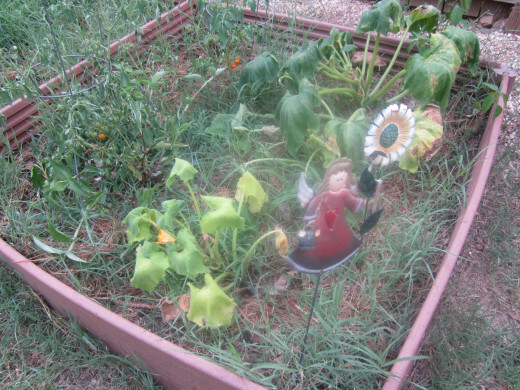 Great Hub that tells the truth about planting a garden, which I do every year. There are actually people who enjoy weeding. I'm not one of them.Voted up and funny. 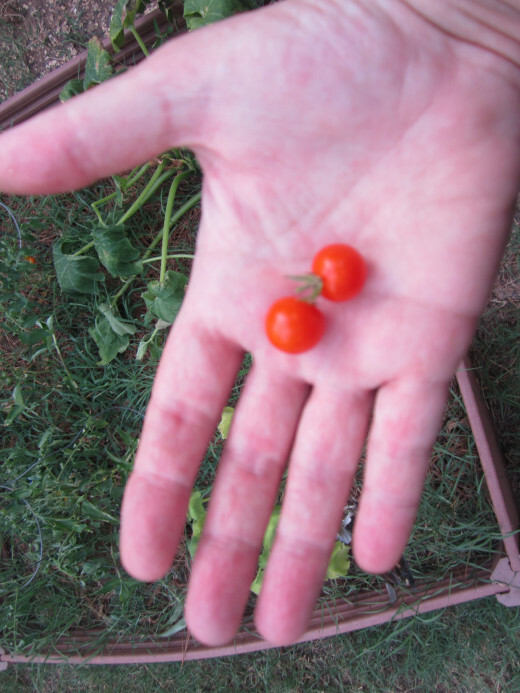 I have eaten some of the most expensive tomatoes in the world -- the few I've grown in my own garden. Where are the rest...Oh well maybe I'll start a band. I'm the same way. I tried growing tomatoes and potatoes I had more luck with the potatoes, really they could have stayed longer in the bed I made but winter was well on it's way. The tomatoes crumped and looked really bad. Voted up useful and interesting, Joyce. ComfortB--Your comments are funny, too. LOL. I'm going to keep trying. I have hopes. My mom had huge gardens even with 4 kids and working full-time!! She canned stuff, froze stuff. I, on the other hand, work from home, have no big family, and harvest two cherry tomatoes. Oh, I did have one squash before the bugs got them. Thanks so much for your awesome comments! Vee......I'm speechless. Don't know what to say. I'm honored you wrote a hub about me!! Thank you! Welcome to the club of horrible gardners. Tried it for 2 years, I actually did very well with my bell peppers and okra, but the weeds and bugs (of all shapes and sizes) just did me in. Now I'm a frequent buyer at the farmers market. Don't give up though. There's hope for those rubber mats. Voted 'hilarious', that is, funny. Thanks, kelley. I really would love to get most of my produce from my own garden, but I don't have the patience to do things right, I guess. I wanna see YOUR pictures!!! Victoria - Absolutely hilarious! You have the best looking weeds I've seen in a long time! Bill--LOL! Those little tomatoes were tasty! Heck, yeah, I try. I throw out seeds, water, pick a few weeds that keep coming back--why don't the seeds just take off and grow! Dang--maybe I'll get better at it one day. Some Preen would probably help. Maybe some fertilizer, too? LOL. I need a hub "Idiot's Guide to Gardening" in 3 easy steps. Thanks for coming by, Bill. Glad you liked it! Great looking tomatoes...LOL...that sounds like a horrible pick up line! Hey, you try, right? I love the line that you expect them to buck up and grow. What do they want from me? I planted them, watered them and tried to keep the weeds back! Seems like those seeds have to take some responsibility, right?